It’s a well-known fact that Spring is the best season for sellers to put their homes on the market. This Spring is no exception as the market in Central Florida is hot, hot, hot! If you’re thinking of selling your home, here are some great tips for preparing your home for sale. Make a lasting first impression. The National Association of Realtors states that 63 percent of homebuyers will drive by after viewing a home they like online. Make your curb appeal count and let it serve as a preview of how much they will love the inside. Take off your homeowner’s hat, go outside and walk around your entire home to see what buyers will see. This includes looking up at your roof. Are your shingles in good shape? Do you need to clean, repair, or replace the roof? Next take a good look at the paint. At roughly $25 per gallon, you’ll find that paint may be your new best friend. Spruce up your front door and shutters. Repaint your mailbox. If needed, consider having the house and trim repainted entirely. Most people underestimate the impact of power-washing. Brighten up your sidewalks, decks, driveway’s and garage floor with a good power wash. 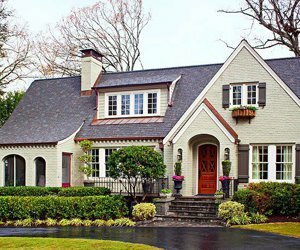 This is an extremely cost-effective way to boost your curb appeal! Last, but not least, add some touches to make your exterior pop. Make sure your landscape is neat and tidy. Add colorful flowers both in your landscape beds and in pots. Hang a wreath on your front door. Replace your porch fixtures and add a new door mat to welcome potential buyer’s home. Much like the kitchen, bathrooms are a high priority for buyers. Depending on the price point of your home, your investment in the bathroom may vary. For high end homes, sellers can safely invest in trendy new amenities like free standing garden tubs and floating sinks. Standard wins for all sellers include solid surface countertops, new faucets, updated light fixtures, attractive bathroom mirrors, clean grout, and gleaming sinks, tubs and shower stalls. 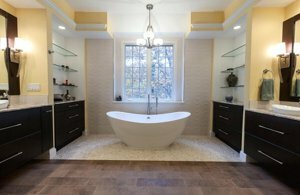 Bathroom upgrades tend to bring in 90 – 100% return. But again, be mindful of your home’s price point and plan your upgrades based on your anticipated sale value. How can you get the most bang for your buck? One of the least expensive and easiest updates sellers can invest in is a fresh coat of interior paint to set the tone for a clean and well-maintained home. Walls, ceilings, doors, and trim. Choose light, neutral colors for the walls for a soft relaxing atmosphere that will appeal to the majority of home buyers. Use a satin or semi-gloss paint on the doors and trim. Buyers will appreciate the easy maintenance in the future. Another easy project with big impact is flooring. Most buyers today look for homes with little to no carpet. If you do have carpet, make sure it’s in great shape and free of stains and odors. Pet owners should pay particular attention to carpeted areas. If the carpet needs replacement, consider installing wood or tile in it’s place. At a minimum, if installing new carpet, be sure to choose a light, neutral color. Combining fresh interior paint with updated flooring will get your home under contract more quickly, and provide a great return on investment! 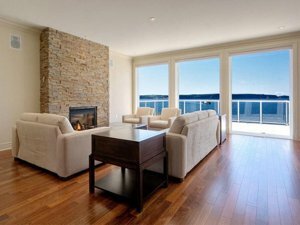 It’s important not only to have your home furnished but staged well too. Make your home as neutral as possible allowing potential buyers to envision their belongings in the space. Keep the size of each room in mind when staging. Oversized furniture can make rooms appear smaller than they are. Scale down the furniture to make your home look spacious and inviting. Donate or store furniture and personal items rather than clutter your garage and closets. Clean, organize, and declutter your closets, pantry and cabinets. Just because a closet or cupboard has a door, doesn't mean it's off limits. Buyers can, and will, explore these areas so make sure to add them to your staging. Clean your windows and open the blinds and curtains for showings to flood your rooms with sunshine! If natural lighting is not one of your homes best features, add floor and table lamps to areas not well served by natural or ceiling lights. Brighter is better so light it up! If you're thinking of listing your home in Central Florida but aren't sure where to start, give me a call! It's always my pleasure to guide you through the process of preparing your home and listing for a quick sale.